The first workout for the 2018 Dubai CrossFit Championship has been released on the competition's website. Participants may register for the event until the close of Week 1 at 4 p.m. GMT+4 on Oct. 7. For details, visit the Dubai CrossFit Championship website. You can also follow update on their Instagram account. 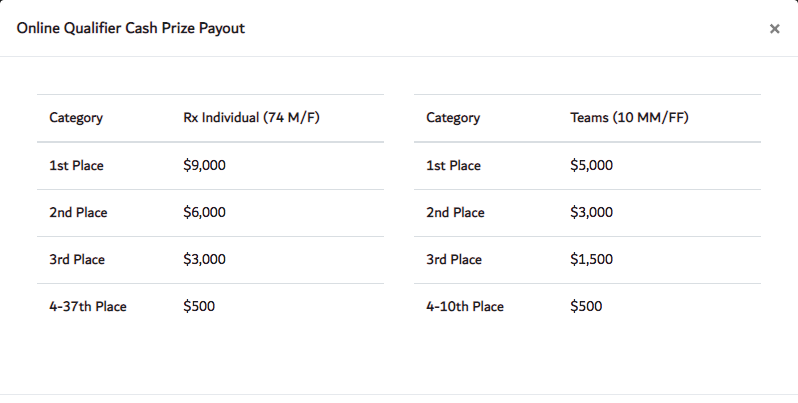 The online qualifier has an $83,000 prize purse, which is part of a $616,000 prize purse to be paid out through the course of the competition. A breakdown can be found here. CrossFit-sanctioned competitions are replacing CrossFit's Regional events, and will become a direct pathway for the top men, women and team competitors to receive invitations to compete at the CrossFit Games. The Dubai CrossFit Championship is one of seven CrossFit-sanctioned events. Additional sanctioned events will be announced in the coming months. As with all CrossFit-sanctioned events in the 2019 Games season, should the top male or female athlete at a CrossFit-sanctioned event qualify for the CrossFit Games by other means, the number-two podium finisher will receive a Games invitation. Athletes can qualify for the 2019 CrossFit Games via four paths: (1) winning their country’s national championship as determined by the worldwide CrossFit Open; (2) taking first place at a CrossFit-sanctioned event; (3) placing within the top-20 finishers in the 2019 CrossFit Open; (4) or participating as one of four at-large athletes selected by CrossFit Inc.